"You guys just don't understand how hard it is living with a woman who gives you electric shocks." Disc three of Urusei Yatsura delivers more screwball comedy as we continue to explore the world of Ataru Moroboshi, the unluckiest man alive, and his resident alien wife, Lum, who provides electric shock therapy in answer to her husband's continuously roving eye. What makes UY one of my favorite series is its complete lack of pretentiousness: it isn't trying to break new ground, or be convoluted in its storylines, it sticks to a formula and makes it work. With each disc the cast grows, adding yet more female attractions for Ataru to go mental over, and as usual, wife Lum and girlfriend Shinobu are there to berate him for his wandering. The fact that none of the women Ataru tries to win over want to have anything to do with him adds another layer of humiliation to his cause, and with aliens, princesses, demons and evil spirits, the amount of trouble that can be stirred up by a lecherous idiot is practically boundless. Disc three introduces yet another major character. In Princess Kurama, Seeping Beauty, a drunken crow, who looks more like a penguin, is on a mission to find a mate for his master, the Princess Kurama, who can only be awakened by a kiss from her future spouse. It's no surprise that Ataru finds himself ogling the crow babe in her stasis chamber, and much to the chagrin of the other wardens, breaks the seal and brings the girl to life. Not at all impressed by this impudent excuse of a man, Kurama, who is fated to marry him, decides she must conform Ataru to a more respectable personality. Expecting to get lucky by complying, Ataru submits, but can he really be purged of his womanizing attitudes, even when subjected to Athletics in Woman Hell? Of course, his bikini-clad alien bride has some objections to this new interloper, as does Shinobu, so the cat fighting is set to begin! Next, with winter fast approaching, Ataru is making the most of his last opportunities to do some leching before the cold weather means girls begin to cover up. His friend Megane and Lum's Stormtroopers, becoming increasing jealous over Lum's inexplicable attraction to him, decide to set Ataru up with a scheme they hope will make Lum dump this unappreciative lout. If there's one thing Ataru can't resist, it is the opportunity to score, so when he gets a secret love letter asking for a rendezvous, he has no choice but to oblige in Pitter Patter Christmas Eve. A new spin on an ancient legend is presented in the New Years Special Program as storyteller Murasaki Shikibu (author of the world's first novel) takes us back in time when Ataru Gengi Goes to the Heian Capital. This episode introduces Mendou Shutaro, another major player, whose ancestors are dealing with a strange case of alien abductions in Heian Era Kyoto. When Ataru's predecessor shows up, the course of history is about to be rewritten, unless Lum does a little intervening. With Lum feeling a need to exert some youthful energy, Ataru gets his hopes up when Sakura invites him on a date, but isn't prepared for the crowd she's also invited, or for meeting Tsubame, Sakura's boyfriend, who has magical abilities. With the group at a local disco, Tsubame decides to unleash his powers, which turns the evening into a demonfest, which Cherry tries to counter. In Father, You Were Strong, Princess Kurama decides to take Ataru back in time to learn a lesson or two about being a gentleman from none other than her father, but doesn't expect the impact the boy may have on her future. Even without the cultural references divulged by the liner notes included with the set, Urusei Yatsura is a very funny series, but the background demonstrates just how clever the writing really is. While some may be turned off by the simpler, old style animation, and lack of an overall plot, these are part of its charm. The fact that it doesn't require successive viewing to follow the story and its short, half-episode format also makes UY the perfect show to pop in when time is limited. As the basis for many of the shows that have developed since it first aired, Urusei Yatsura is an essential part of this otaku's collection, for its wacky sense of humor, great characters, and overall fun content. Image Transfer Review: Image quality is good throughout. Colors are reasonable, though inherently less vibrant than today's norm, and there is a bit of bleeding especially in deep reds. Black levels are solid, and compression issues are minor. No rainbowing was noticed this time out. Considering the age of the series, this is pretty decent. Audio Transfer Review: Mono Japanese audio is the only option, and is respectable throughout, aside from some hiss. Not a showcase title by any means, but serviceable none the less, and suitable to the program. Extras Review: As with the other volumes, the menu is pretty basic, with access to the start of each half episode. Once again we get a host of liner notes on menu-sized cards, covering a lot of background and cultural details. These demonstrate just how well the show is written, as there are tons of double meanings and nods as historical and cultural figures. We also get a capsule of the various characters in the show, along with the episode by episode coverage. A lot of depth is added with this extra. The back panel features blurbage on Ataru's semi-girlfriend, Shinobu, who also graces the front cover. 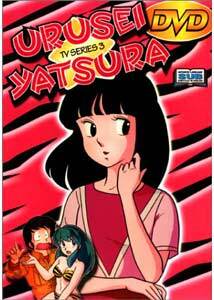 More wacky characters and situations come to life in disc three of the Urusei Yatsura series. An anime classic, the humor is abundant, the situation incredible, and the leching non-stop. Although the animation may seem a bit primitive by modern standards, there is still a lot of entertainment value to be had, and the pack-in liner notes make for an even more enjoyable experience with an added appreciation for the clever writing.